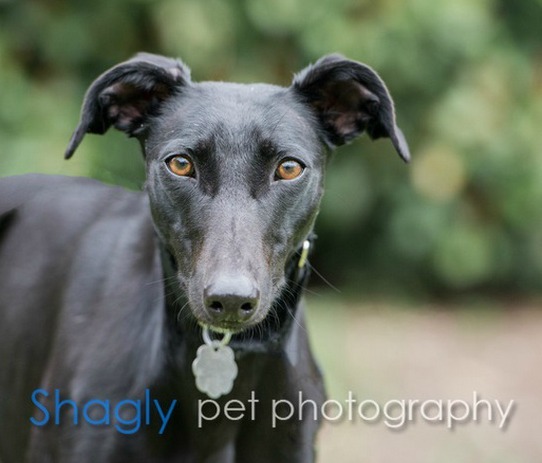 Moxie is a black female greyhound found as a stray in Itasca, TX. She is estimated to be about 18 months old. Moxie is a smaller girl, weighing in at just 35 pounds right now. 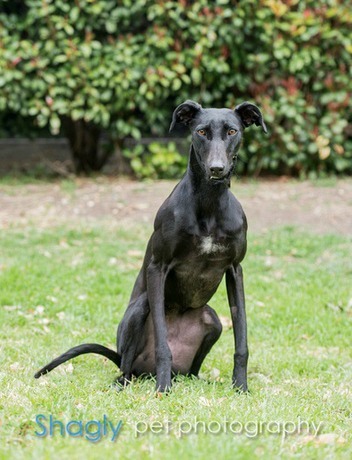 She would do best in a home with at least one other dog. Moxie has passed an initial cat test. Miss Moxie is a petite FUN machine! Don't let her small size fool you, she is a little dynamo. She is an equal opportunity playmate - comfortable with dogs twice her size or just her size. Big mouth bitey face and tug of war are her games of choice. If a buddy isn't around, Moxie can entertain herself with a rousing game of toy toss. Beware though - anything on the floor is rightfully hers! She will add shoes and clothes to her collection if you turn your back (or leave a closet door open). Moxie does not like to be crated and she has to be with other dogs. She passed her cat test, though has not yet lived with kitties, and seems to be okay with dog savvy children. She is good on the leash though she prefers to do her business in the yard, in private. Moxie is shy, yet super curious. She will cower a bit if people come near, then you turn around and she's right there. We can usually find her curled up with one of the dogs or sitting in a chair close by. One of her most endearing qualities is her smile, a toothy snarl-looking smile! Her pearly white teeth against her black face is so infectious, you can't help but laugh. Moxie is a very sweet girl in search of a home with other dogs, a yard, maybe a cat and lots of love.